I find that capturing photographs of other people viewing art or in the process of creating it is a fascinating thing because it's about the original object itself in the photograph, but also about a new object formed by the photograph and how the two images inform each other. Needless to say I'm not the first person to remark on this - the German photographer Thomas Struth's series of photographs, "Museum Pieces," is a remarkable exploration of this. 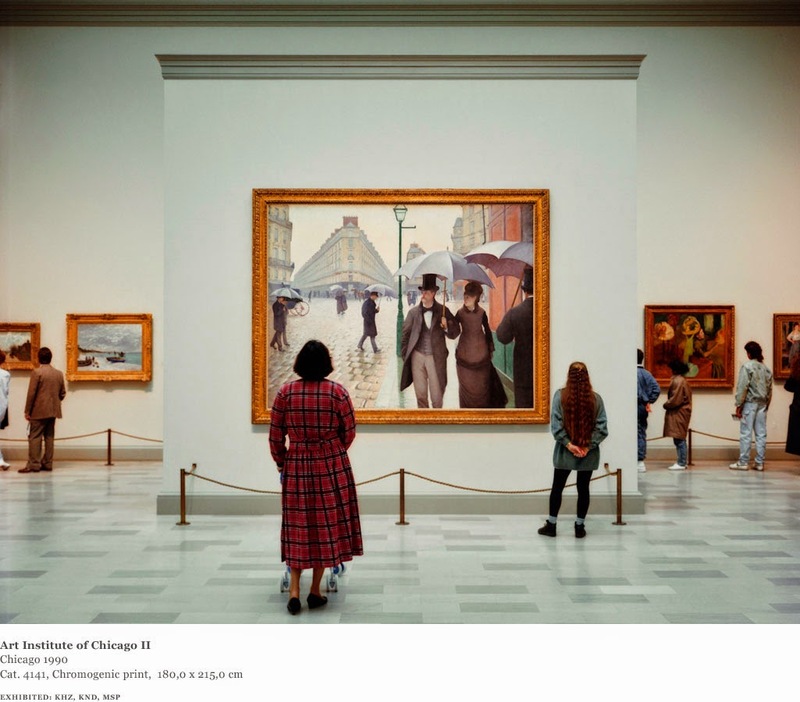 For his series, Struth went to a variety of museums including the National Gallery, the Louvre Museum and the Art Institute of Chicago to document how patrons interact with the masterpieces on the walls. As Struth says in an interview about his photographs, "I wanted to remind my audience that when art works were made, they were not yet icons or museum pieces." When a work of art becomes fetishized, it dies." My theory is a little simpler, I suppose. I'm interested in what captures someone's attention so much that they feel compelled to document the moment, and how that in turn catapultes my own intrigue to capture the process of inspiration from my unique vantage point. Voyeurism this is not, though. Rather it's a way of looking at art through a newly opened but soon-to-be-closed window. As the first photograph suggests in the beginning of the post, during my lunch hour I stumbled upon a makeshift showroom in midtown Manhattan. The fact that a professional photographer was in the process of his work was enough to wrangle my attention, but when I saw he was taking pictures of a vintage Ducati, well, it didn't take long for me to take out the Sony RX-100. It was a closed set so I had to press the camera directly against the windows to fight against the glare to get the pictures of the motorcycles (though you can still see some glare, regardless). Ducati motorcycles invoke a lot of feelings in me. There's the part of me that wants to support American-made motorbikes, but there's also the part that just recognizes how aesthetically endowed the the Ducatis are. Standing still they appear to be in swift motion, and they're the sort of thing I could see Dante blitzing around the corners of Florence with Beatrice holding on tight behind him. I'm not the only one to romanticize the bikes. The polarizing poet Frederick Seidel owns a couple, and mentions them frequently in his poems (in addition to places like Claridge's and the Carlyle where poets don't normally hang their hats.) From the collection Ooga-Booga, Seidel conflates the femininity of his Ducati with the memory of a woman: "I ride a racer to erase her / Bent over like a hunchback / Racing leathers now include a hump / That protects the poet's spine and neck." The collection also included some Agustas and at least one Laverda (the one in orange). As I was taking the photographs I realized that I had done a DP post on BMW vintage motorcycles back in 2009 (!) that you can find here. At first I thought, what a waste! These guys are inside and totally absorbed in activities that don't involve obsessing over the motorcycles. If only I was inside too! I had to remind myself, though, that I would have to leave the area at some point too, and would probably text someone while going to pick up lunch - just what these guys were doing. I was glad though, that I had this break to remind me of the power of craftsmanship and design, and that sometimes these moments come to you even in such ordinary times like your lunch hour.